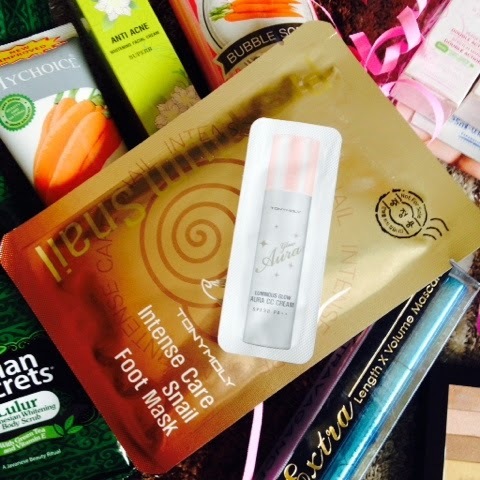 Unboxing the (2015) April BDJ Box: Spring Into Beauty* | Vanity and Everything in Between. Another reason why I was looking forward to the weekend was because BDJ Box was on its way to my doorstep. Tried to wait for it but we had to leave so I wasn't able to unbox until Sunday. All the more that I got excited! April is Spring time and BDJ was very on point with their theme. First thing that came to my mind though was a box full of makeup (with pinks and yellows, you know, Spring colors). What greeted me when I opened the box though was a handful of skincare products! Okay na din cos it's so humid cos it's summer and I need all the shower comfort I can get! 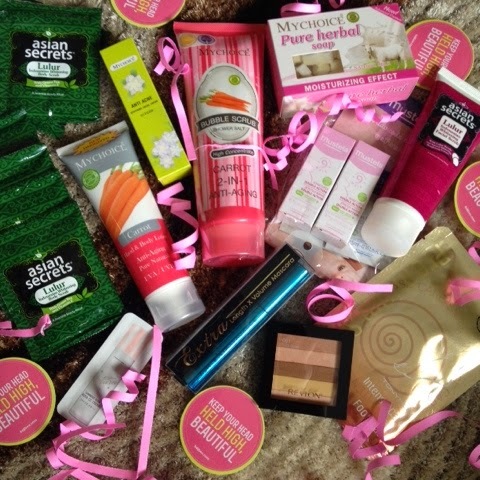 I don't remember the last time I got so many products in a BDJ Box! Asian Secrets Lulur Whitening Facial Scrub (100g, PhP120) - this Javanese Princesses inspired scrub delicately removes your dead skin cells, leaving your skin supple and smooth. The lulu beads gently exfoliates and removes dead skin cells and black heads to smoothen and give skin a fairer, white and radiant glow. Asian Secrets Lulur Whitening Body Scrub (20ml, PhP15) - feel refreshed and revitalised this summer! Include on your shower ritual for a more relaxing and rectifying bath time. Gently exfoliate two to three times a week to wash away dead skin cells and reveal a fairer skin. I never knew that Asian Secrets has a facial scrub! I liked this product because Solenn is their endorser. Haha! I've emptied several tubs of their body scrub and quite honestly, I no longer know how it feels like. So, I used this yesterday when I took a shower! Love its refreshing feel that it gives to my skin! MyChoice Hand and Body Lotion (100ml, PhP70) - it's the fruit lotion fryer skin that's friendly for your pocket. It soothes skin from all over allowing it to breathe new life and rejuvenate like never before. 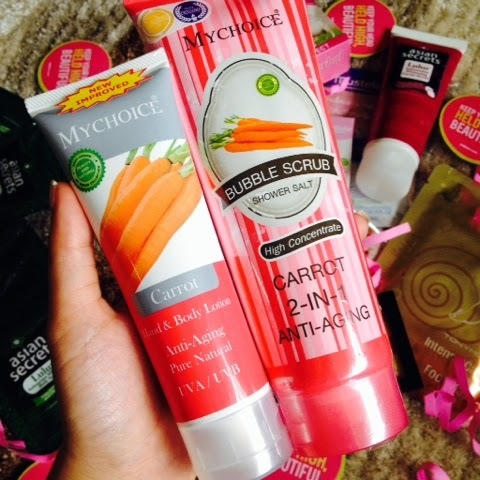 Safe for your skin as it come from natural ingredients and fruity flavours which you'll surely like. MyChoice Bubble Shower Salt 2-in-1 (225g, PhP100) - Pamper your skin with this newly improved 2-in-1 bath salt with soap that is made from natural ingredients which is perfect for all skin types. It comes with five variants leaving you options fitted for your skin needs. May it be moisturizing, rejuvenating, lightening, anti-agin and refreshing need that you are wanting to solve, make it easy solved with MyChoice Bubble Scrub Shower Salt 2-in-1. Use this as everyday soap when having your bath and have that overall skin glowing you always wanted. I need clarification. Is MyChoice a new brand? I'm totally clueless but I do hope that their products will not disappoint. MyChoice Anti Acne Cream (20g, PhP350) - formulated with multi-functional anti acne ingredients that strengthens its ability to help you be acne free. It also contains AHA and BHA that desquamate acnes gentle without causing skin irritation. Daily use allows complete healing but visible result can be seen in just 3 days after application. 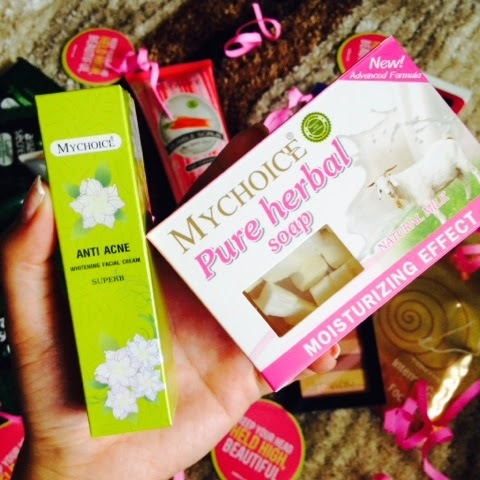 MyChoice Pure Herbal Soap (100g, PhP55) - contains natural ingredients that will help your skin in preparing damage, solving wrinkles and acnes, moisturising from deep within, refreshing naturally, protecting against damage and a whole lot more. Use all over the body day and night for better results. Mustela 2 in 1 Hair and Body Wash (200ml, PhP520) - this tear-free cleanser for both hair and body is soap-free and specially formulated for the delicate skin of babies and children. Mustela Stretch Marks Double Action (150ml, PhP1750) - this product reinforces skin's elasticity and suppleness and stimulates cell renewal to prevent stretch marks while also moisturizing your skin. Mustela Hydra Bebe Body Lotion (300ml, PhP790) - this body lotion is designed for the daily care of your baby's skin. Containing vegetable oils and vitamins E and F.
I've heard good things about Mustela from mothers. But I don't have a baby yet. Will give this to my preggy friend as these products will be of use to her. Then I'll just ask her how she likes it. Tony Moly Intense Care Snail Foot Mask (18ml, PhP198) - its's a special foot mask to supply full of moisture and nutrition to dry skin. It contains snail slime extract which is known for stimulating collagen formation and moisturizing properties. Its unique formula speeds up the skin renewal process allowing the outer skin to mature and peel away - painlessly - giving way to new skin. You can keep fresh feeling with it for a long time without stickiness with moist and refresh use. BONUS: Tony Moly Luminous Glow Aura CC Cream (30ml, PhP1098) - it's an all-in-one product that whitens skin, acts as a sunscreen lotion, moisturises the face and can be used as a makeup primer. FS Cosmetics Lash Extravagance Mascara (9g, PhP625) - get big, bold and flirty lashes this summer by sweeping on Lash Extravagance Mascara. The tiny bristles make application easy for both top and bottom part and gives you beautiful lashes to bat. Apply one coat to achieve a defined look. Show luscious, curled and dramatic eyes by applying two coats. Apply a third coat to give intense yet extravagant lashes. Revlon Highlighting Palette (7.5g, price unconfirmed) - the highlighting palette gives you an all over sun kissed glow for day to night. 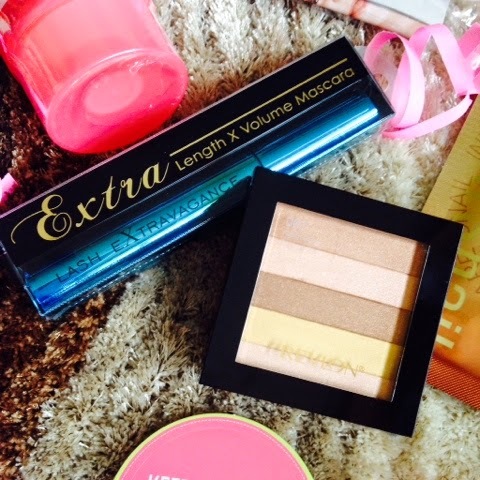 It has complimentary shimmer shades which are easy to blend and enhance the complexion for a radiant sun kissed look. It works well as highlighter, eyeshadow and blush giving you a multi-dimensional sculpted look all rolled in to a single useful palette. I was hoping for this box to have more makeup since last month's box was full of skincare already. But hey, I like this box just the same cos it rekindles my affair with Asian Secrets and I got to know a new brand which is MyChoice. Another thing I like about this box is that it includes products that I can use daily (in the shower). L and I once talked about the products being sent to me and we agreed that we can both enjoy the bath products (except those that smells too girly). This month's box is worth around PhP1,500-2,000 if you add everything up. I only gave a ball figure because I don't know the exact price of Revlon Highlighting Palette. Not bad for getting this box for only PhP580, right? There are frequent questions how to get a BDJ Box. All you have to do is go to www.BDJBox.com and create an account and subscribe. A subscription box costs PhP580 only and you are sure to get your money's worth because the products inside are always worth above PhP1,000. If you want to save some more, you can choose the 3-month plan for PhP1,700 or the 6-month plan for PhP3,300 only. Thank you BDJ Box for yet another great box! thanks for the unboxing Ms.Gem. since it was summer already im expecting suncare protection sana plus makeup hihi! Medyo mas pihikan ako with hair and skin care products, so I would like more makeup-centric boxes. However, if the collective value of the items inside is already sulit, pwede na rin yun. Especially that it's a full-full box that you got. Foolproof Sunscreen Products for Summer! Looking Good the Morning After. L'Oreal's Miss Manga has Arrived in Manila! Products That Didn't Work for Me!